Casino Supply Roll the Dice Multi Pack Metallic Confetti: 1 oz. Sprinkle our Roll the Dice Multi Pack Metallic Confetti - 1 oz. on tables at your casino party or put it in invitations and get ready to roll! Our Roll the Dice Confetti contains 1 oz. 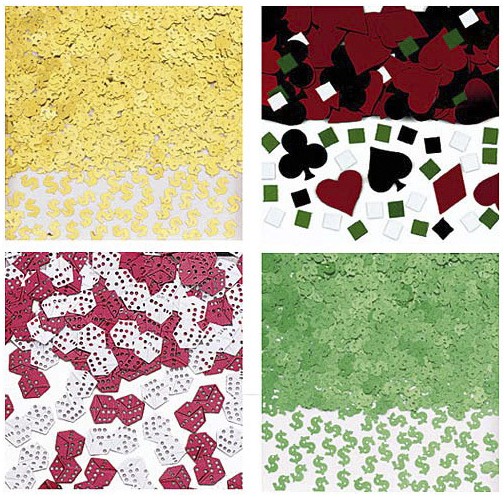 of confetti in individual packets of gold dollar signs, green dollar signs, red and white dice, and card suits. Great for any poker or casino night party themed event. One ounce will lightly cover an 84 inches long x 54 inches wide table cover.